Just because a home isn’t built on-site doesn’t mean that it can’t be energy efficient. 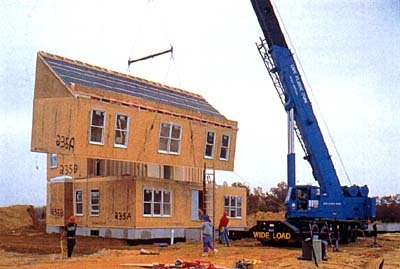 Manufactured homes – which are built piece by piece in a factory and then transported to a building site and installed – have been around for decades. And with a little planning, they can be just as green as any other home. Before 1976, there weren’t a lot of standards to guide the energy efficiency of manufactured homes. In that year, the U.S. Department of Housing and Urban Development (HUD) code took effect, and energy efficiency began to improve. The HUD code is a set of standards for manufactured homes around design and construction, strength and durability, fire resistance, energy efficiency, transportability and quality control. And while the HUD code is a good starting point, there are a lot of things manufactured home owners can do to improve the energy efficiency of their home. Install a geothermal heat pump. These heat pumps can provide space heating and cooling. They need to be installed at the same time as the home, and they can’t be moved, so they should be used in homes that are going to stay where they are. Add a sunspace to harness passive solar energy. Maximize sun exposure to the home, and use landscaping (like windbreaks) to help with energy efficiency. Solar water heating is an option for homes that are staying put. These systems have two options: lightweight roof-mounted air collectors, or heavier liquid-type solar collectors that can sit on the ground. Install photovoltaic systems (solar panels) on the roof to harness solar energy. Install a small wind electric system to generate electricity. Just because they are not built on-site doesn’t mean that manufactured homes have to be energy wasters. Use the tips above to save money and make your home amazingly energy efficient, and amazingly yours. If you need help making your current home more energy efficient, more comfortable and more durable, call your local Building Energy Pros affiliate. Visit www.buildingenergypros.com or call 1-800-309-6006 for more details.